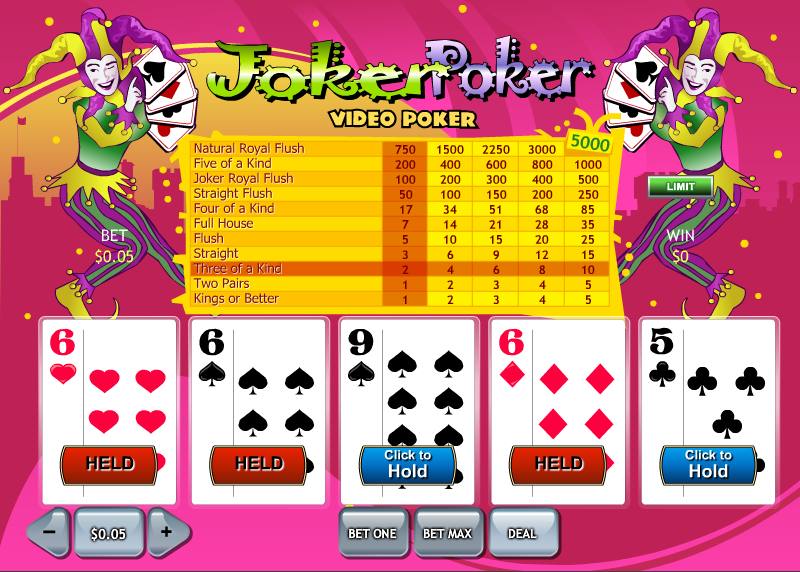 Fans of video poker may like to read the following review of Joker Poker; it’s a relatively simple example of the genre from Playtech which would probably suit beginners but there are also plenty of bet levels and a gamble feature which gives players the opportunity to wager each win in a ‘Play Your Cards Right’ mini-game. 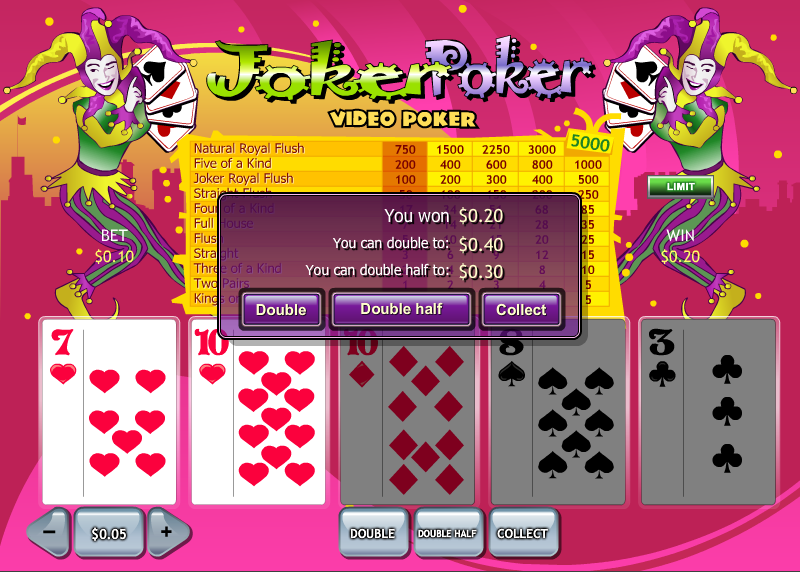 Joker Poker is graphically pretty basic, something you will notice as soon as you load it up. Two colourfully-clad jokers brandish playing cards either side of the paytable which itself sits above your cards. There are five betting levels which provides a betting range of between £0.05 – £5.00. Bet levels are altered by clicking directly on the required column on the paytable. There’s an incentive to go for the maximum bet level which pays a disproportionately large 5000x your stake for a Royal Flush. Once you’ve selected your stake and betting level all that’s left is to press the ‘Deal’ button at the bottom of the screen. Your five cards will be revealed and you can now choose to ‘hold’ any of them in the hope of creating a better hand in the second deal. In video poker the lowest winning hand is generally a pair – here the minimum winning hand is a pair of Kings but this disadvantage is offset by the appearance of two jokers which can substitute for any card to make a winning hand. If you’re a winner then you now get the chance to double that amount by choosing that particular option. A set of cards will appear with the one of the left revealed; just choose one of the other cards you think is higher. A higher choice wins, lower loses and a tie returns your stake with the option to try again. You can also opt to gamble just half your winnings and bank the rest. This is a very basic version of video poker which is slightly redeemed with the addition of the gamble feature. Those looking for a slight edge may lie to know that the RTP for playing the maximum bet level is 98.60% while lower levels are 97.96%. For optimal gameplay, check out our video poker strategy page.